David shares something of his rural background. I grew up on my parent's mixed farm on the Darling Downs where we ran sheep for fat lamb production, grew a variety of grains, ran a few cattle, as well as some irrigation. I stayed on the farm all my life working with my father, although I also went away doing a wide range of jobs on a casual basis; ie. fencing, yard building, header driving, tractor work, scraper driving, welding, fitting & turning etc. We farmed organically for the last 10 years of my farming life achieving Level A Registration with Biological Farmers of Australia. About the same time I heard about Brix Meters (Refractometers) and how they are used to check the sap of crops or other plants while they are growing to determine the nutritional quality of a crop. After seeing one used we borrowed a unit a few times. It wasn't long before we purchased a unit and I became one of the pioneers of measuring plan sap with a Brix Meter. 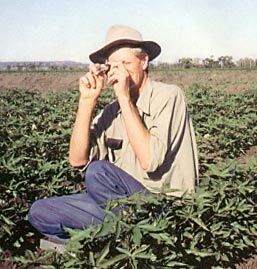 The majority of farmers in Australia had never heard of being able to check the health of their crops so simply. Others farmers soon heard what I was doing and came to me asking if I could obtain meters and support information. And so, the idea was born: David von Pein as "The Meter Man"
In 1999, due to ill health, we sold the farm and moved to the city of Toowoomba where I have expanded the range of meters we handle assisted by my loyal and loving wife Elaine. We pride ourselves on personal service and like to talk to people so they get the right meter for the job. And when you do talk to me, you are talking to someone who has farmed for many years and understands farming. Read Obtaining optimum prices by looking after your soil from BFA News.